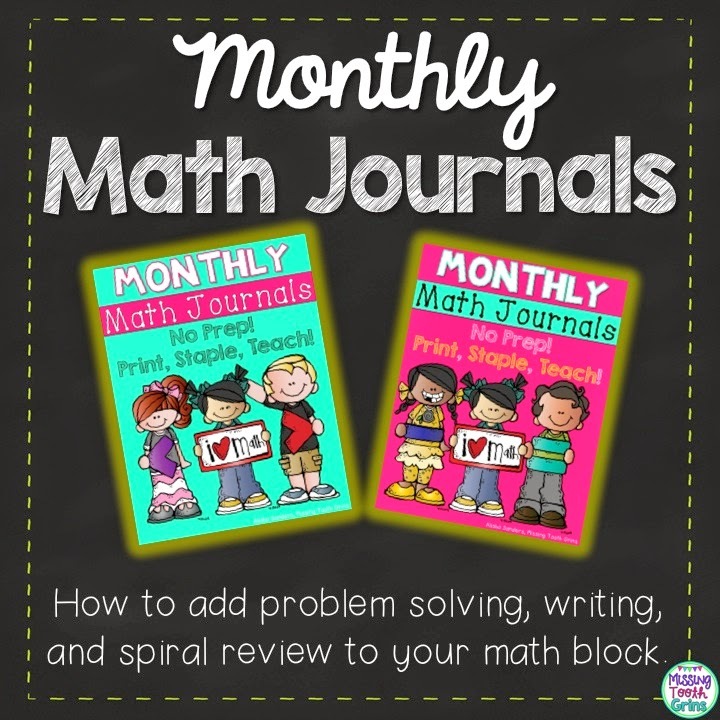 Monthly Math Journals- How We Use Them And Why We Love Them! AND A GIVEAWAY! I want to talk to you all about a part of my math block today. My math time is pretty scrunched up. We have math review every day (required by our district), instructional time, independent work time and journaling, and math stations. I'm going to be extremely honest and transparent. Not everything gets completed every single day. I always make sure that the math review, the lesson, and some independent time happen, but goodness sometimes it's difficult getting independent time in too depending on the lesson. Anyway, I feel that math journals are an important part of our math time. 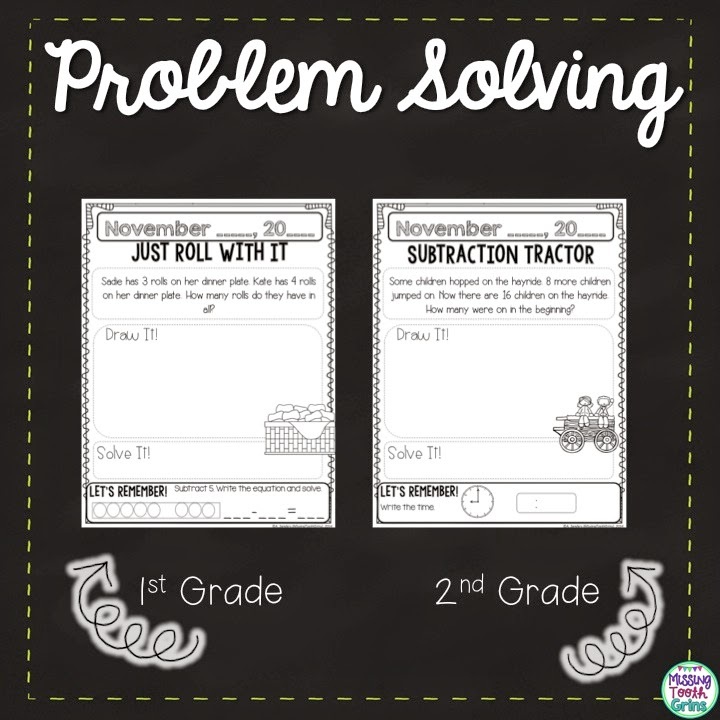 Some of the math pages have prompts in which the students have to write and explain their thinking. By doing so, I will be able to read their answers to see their understanding. This also gives them the chance to reflect on their thinking. For me, it's not as important that they get the right answer as it is for them to explore different ways to solve problems. 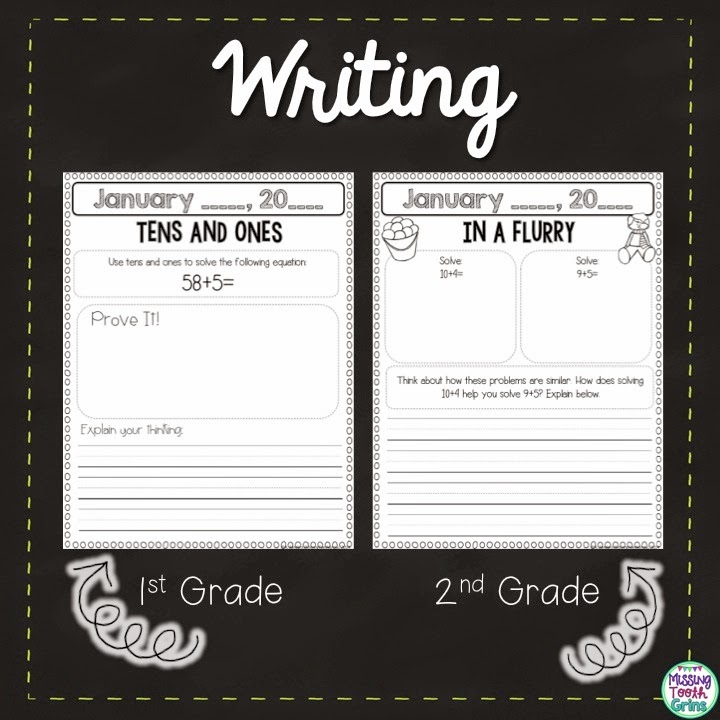 And, I want them to be able to explain in words orally, and as best as they can in writing (they're first graders, so I don't expect a paragraph) their thinking and their process and most importantly, why. 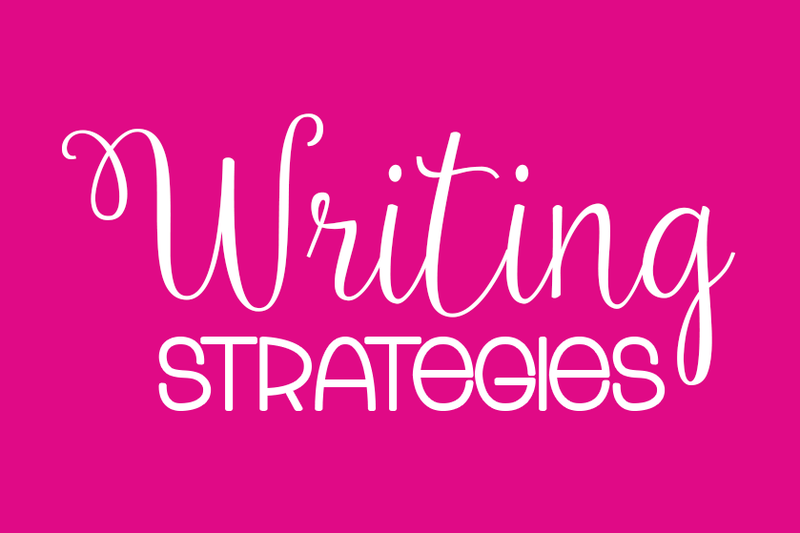 I feel like a two year old sometimes during lessons when I'm constantly asking them why things happen or why they did things that way, but that's a whole different post! At the bottom of many of the pages is a "Let's Remember" section. This section has a question or two of something they learned earlier in the year. I know that with the constant teaching of new material, I need to constantly review with them things they have already learned so that they don't forget valuable knowledge! 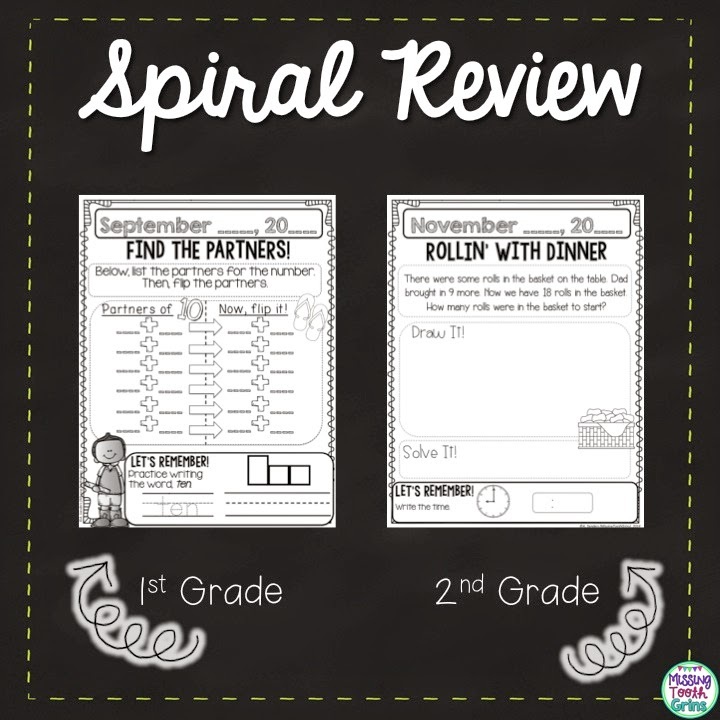 These journals serve as a great spiral review for my firsties. Obviously, there's problem solving in the journals! What kind of math journal would it be without problems solving. As you can see above, there are word problems in every booklet. I think it's important to revisit word problems often! I often have my kids teach one another, especially with the word problems. They love to teach one another and explain their thinking to each other! I am lucky to be in a district with a print shop. So, every month I send these bad boys to print shop and they print and staple them and boom, my job is done! It's seriously awesome! Here's an example of the inside of the journals. I was kind of gah gah over these couple pages because hello, look at that adorable Santa holding the greater than and less than signs! Love. 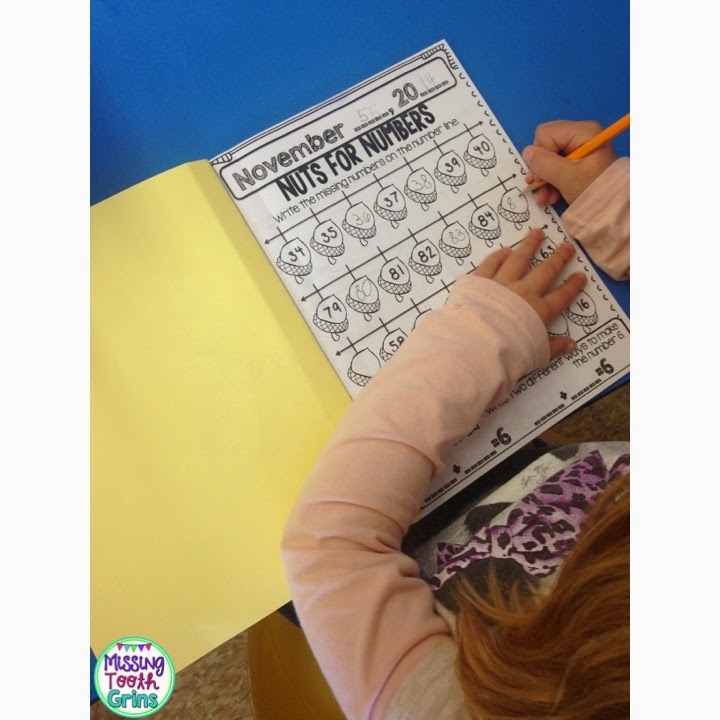 Here's one of my babies completing one the first page of the November journal. 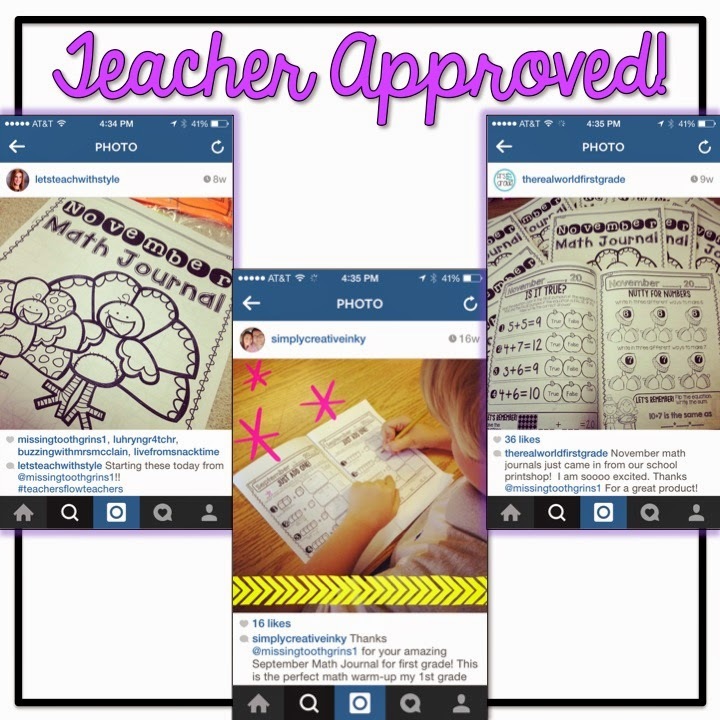 Here's a few Instagram pictures from some teacher friends that use these journals every month! Love when other teachers post my stuff! Makes my TPT heart happy. And, some feedback love. I can't even put into words how much this feedback means to me. 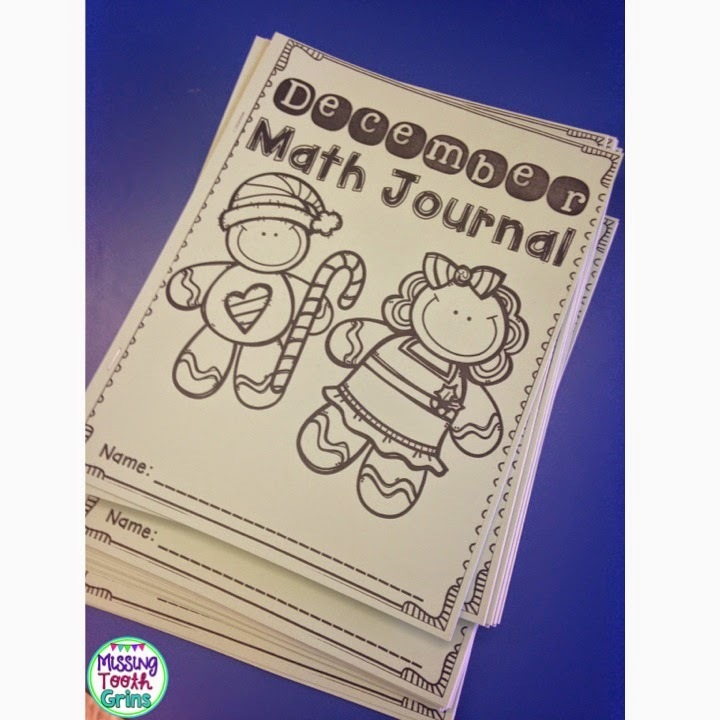 My kiddies seriously cannot get enough of these math journals! They look forward to them every month. It might be because they know they get to color the cover before we actually start the journal, but hey if that's what gets them excited about learning, I'll take it. 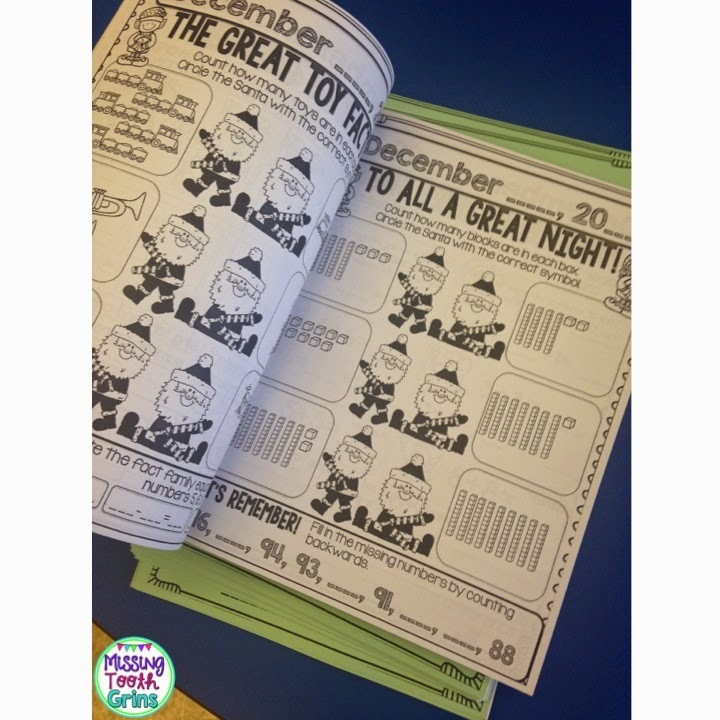 One of my little girls saw the December journals in November (I was super prepared that month... It'll never happen again! Ha!) and asked, "When are we getting our December journals? Can we have them now?" Little girl after my own heart, I tell ya! But, one of the reasons I love making them so much is that I love making them tailored to the month. I'm a sucker for themes. I also love them because I know my kids are getting something out of them and love them as much as I do, if not more! If you're interested in these journals, you can click the pictures below to take you to the bundles. Each description of the bundles have the individual journals listed separately! However, if you know you're committed to these journals, the bundles give you more bang for your buck! Want to win a bundle? Here's how! Just fill out the Rafflecopter below! 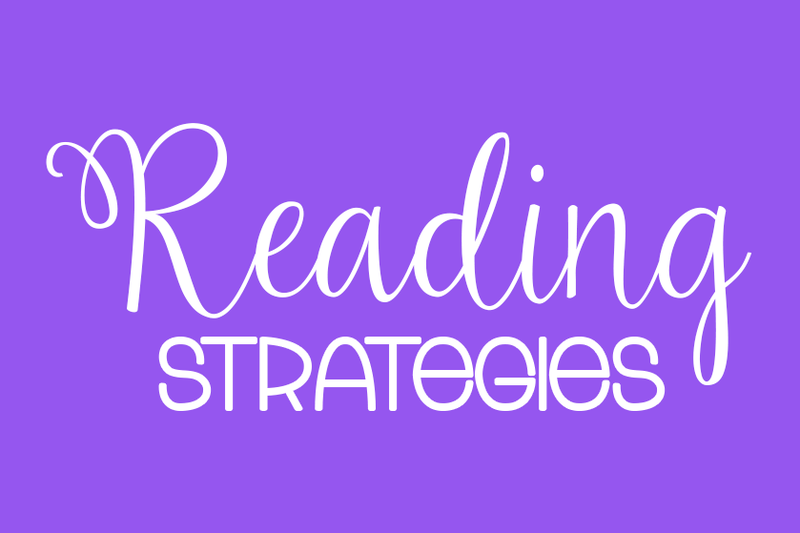 If you win, you can win either a bundle OR $20 credit to my TPT store! It's your choice! 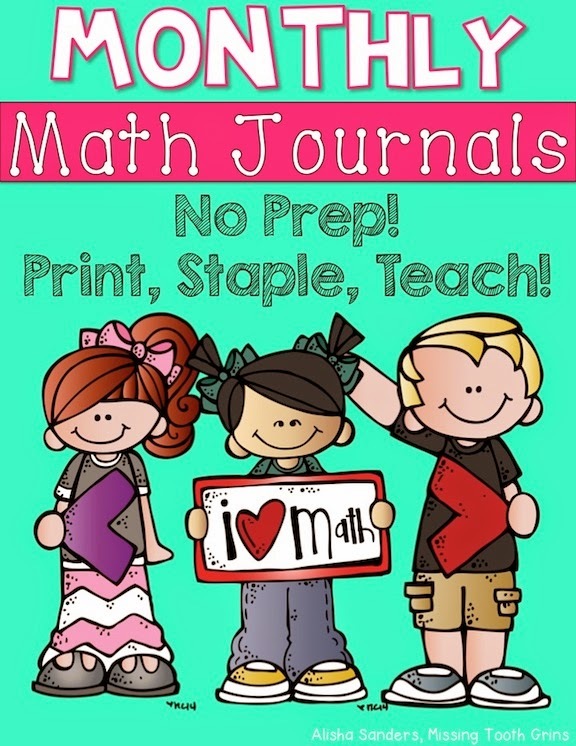 If you win the bundle though, you'll receive all the past math journals! Then, each time I finish a journal for the next month, I will email it to you! 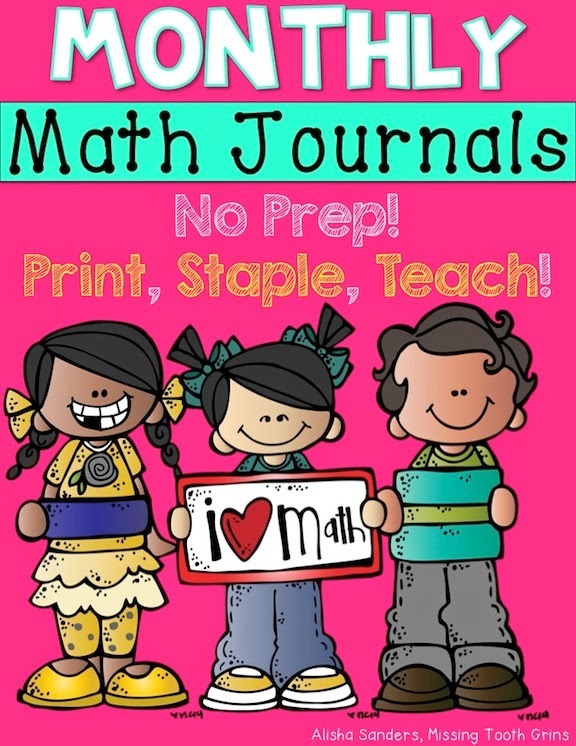 Math journals at your fingertips! I love your graphics, too! Very visually appealing! The Second Grade Math Journal looks awesome! Great job. Such a great idea! I just got a mid-year job in first and would love to incorporate these in our Math Workshop block!!! Such a fan of yours! Thanks for this opportunity! Thank you for the opportunity. Your second grade unit looks fabulous! Would love to try the 2nd grade pack! These look fantastic! Thanks for the giveaway! Love these! What a great interactive daily practice!! I love the look of these! Thanks for the chance to win! Second grade is super!!! I try to do all of those math things you mentioned with my darlings everyday and it is tough to do!!! 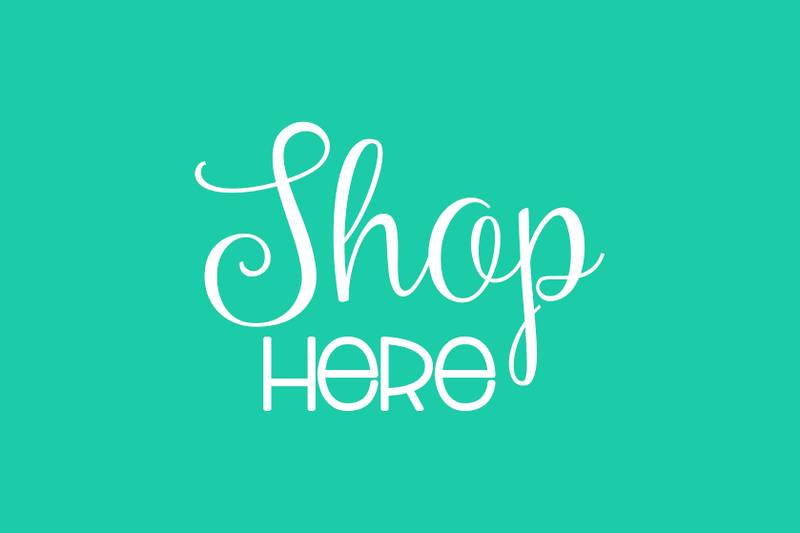 Your product would help me Greatly! I hope I win!!!! Thanks!!! Thanks for offering this wonderful giveaway - hoping I win! This is a great giveway. They look awesome. I just graduated from college and am starting a job tomorrow (yikes!) 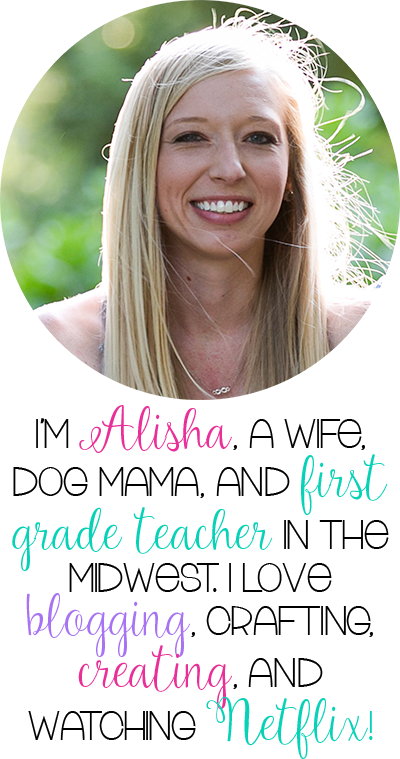 This bundle for first grade would be epic to have as a first year (first semester) teacher! jannafuchs@gmail.com Good luck on your first day back! I just found you on Facebook, and am loving all of your cute things! I'm looking forward to see more of your posts!